Hi Guys, I have a Tiger 1215 Explorer, and what tyre pressures would you recommend for road use mainly solo riding with no extra weight like panniers and top box? Is this also depending on the manufacturer of the tyre? We all make mistakes, that's why they put rubbers on pencils. Then adjust to personal preference if necessary. I have played around some and I find that the 32/39 for the sizes above work out good. If I run the front much higher it tends to cup. Lower it effects handling. Not what it says in mine. As noted above, the OEM recommended Gen1 tire pressures are a bit higher. I also stick with 36/42. My Gen 2 XCX handbook says 36/42, as well. I followed that religiously for the first couple thousand miles and the OEM tires wore like poo (squared back, triangle front). Almost all my miles were fully loaded, touring miles. I changed them to the 33/39 for next few thousand miles, and they wore better, but the damage was done. I'm on my second set of tires (now Michelin Pilot Trails) and I'm sticking with 33/39. After a 1000 miles, they are looking great, whereas the OEM tires were already showing irregular wear. Of course they are different tires, but I think the pressures had a hand as well. After having my OE front Metzler wear so badly, I went the other direction. My original front cupped & wore the inside & outside of the tire so badly that it looked Like I had been running 20 PSI in it. I'm running 40 pounds front & rear now and the Shinkos I've been running are wearing perfectly. I've got around 8,500 miles on the current front & it still looks like new. The handbooks were always specific: for Gen 1 36 & 42, and for Gen 2 32 & 39. 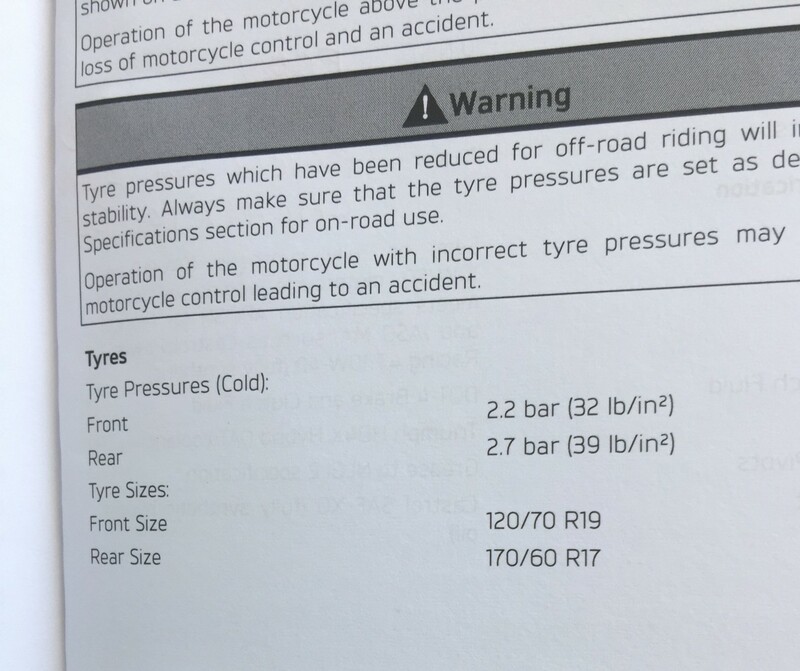 But there was some confusion 'coz the illustration used for TPMS was the same for both. So RTFM don't just look at the pictures! @gufazi - not sure what handbook you have but mine doesn’t say 36/42 (except in the pictures) which for a Gen-2 is incorrect. 32/39 as shown in the body of the text are the recommended pressures for a Gen-2 (and I double checked with a Triumph themselves).